Fortified Marriages Ministry exists to help build strong marriages. We do this in three ways; Marriage Counseling, Marriage Enrichment and Building Marriage Ministry. We invite you to look through our website to discover the many resources available to help build strong marriages. Good marriages do not happen automatically or by chance; they require work and on-going maintenance. 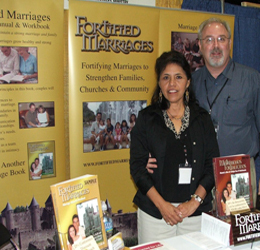 The Fortified Marriages Workbook is a great resource to help couples work on their marriages. The 52 studies in the book cover every aspect of marriage and help couples communicate and work together to build strong marriages. Find out more on our resource page.